I'm battling to get the Multiple Selection to work in my VB app. I'm using DevExpress 17.1.4, VS2017 and the latest Xafari release. I've gone through the documentation at https://documentation.galaktika-soft.com/xafari/doc_multi_select. It seems a bit complicated for me. I would appreciate a simple example or further documentation if possible. I would like to filter a list of customers by using this method. We realized a sample from our documentation to the Multiple Selection in the vb app, see attached file. Thanks for the VB file. I managed to run it but I'm net getting the results I'm looking for. Attached a screenshot of your Feature Center sample. I'm trying to duplicate that in the sample. I would appreciate if you can verify that it works indeed like that. My version only uses DevExpress components and selects one record at a time. I assume I must set my editor to XAFMultiSelectionPropertEditor at some point. Сan you specify how you want to use the filter and what is its behavior? Please, provide us additional information about it. Use the sample zip file you gave me and try to exactly what the Feature Center Sample is doing under Editors \Xafarai MultiSelect Property Editor. I would like to select multiple items on the dropdown as per my screenshot. You VB sample only allows me to select 1 item. 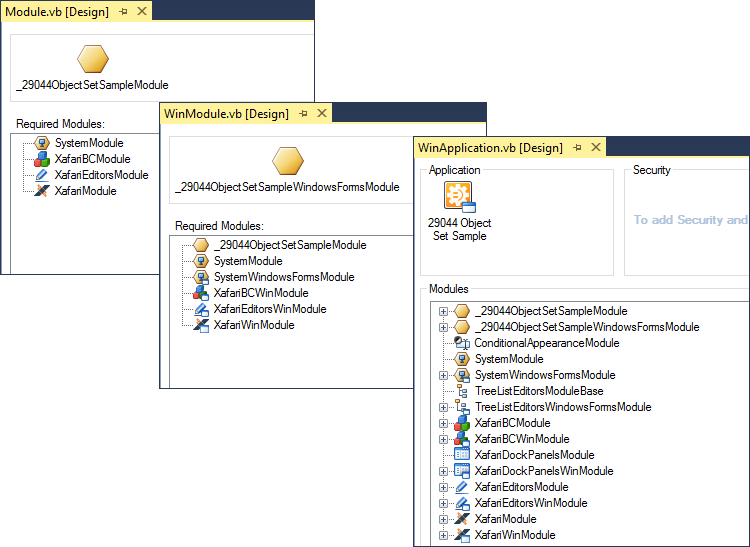 If a Xafari component is used in a project, developer must add appropriate Xafari module in modules of project. Please, test attached file: 29044ObjectSetSampleFix.zip. I'm getting error telling me my version of Xafari has expired. Attached my project and proof of my license file. Is the sample perhaps using dll's from a version that we don't have access to? If you use the dll of Xafari from a version that you don't have access, you get message about invalidate your Xafari license. You can get additional information about the possibilities of purchasing (renewing) the Xafari Framework Subscription if you contact us at info@galaktika-soft.com. I attached a file to show that our license is still valid till Dec 2017. I also attached a reworked sample that you guys gave me. When I run that sample, it tells me my license has expired. My current programs are all still fine. Can you perhaps look at the sample and see whether there are dlls that belongs to a 'bigger' version and therefore I don't have a license for it. 'I'm just trying to run your sample. For correct work the Xafari Multiple Selection, you must add in your project XafariBC(Win)Module (this manipulation resolves your issue above). The XafariBC module belong Business Components, this situation leads to a warning about the license, but your license validate for General Components. If we delete the XafariBC references and module for our attached solution above, you will not have a message about a invalidate license, but you will get the original issue. Sorry, I never checked whether the multiple selection was available under our subscription. Can we upgrade our package and pay the difference ($999-299) pro rata for 3 months and then renew our subscription in early December on the Business package? That is $700*3/12 = $175 now. We sent additional information about the update package to your email address.